Please please read if you're considering the DONA line of products - very important! I emailed Ashley who has been my contact at DONA for a better description of the Camu Camu scent. I explained to her that I saw a review where someone stated it as being very fruity - which is what I know Camu Camu as smelling like from the Scentsy wickless candles. But whenever I smelled Camu Camu, I didn't smell fruit at all. I smelled a very vanilla/french vanilla scent mixed with coconut. In addition, I was reading of other people who were describing it as vanilla/coconut....bot h on the facebook page for DONA and people I was talking to. So what was up? Why was one person describing it as citrus/fruity (which is what it traditionally is) when everyone else, myself included, were saying it was vanilla/coconut? What was I (and the majority of others) missing? Ashley replied back to me and I will quote her below but basically she pointed out something and I want to point it out for those who are reading about the DONA line and wanting to get it. When DONA puts a name by a product like camu camu or pomegranate or blue lotus or whatever...they are NOT describing the scent. They are instead stating the name of the aphrodisiac that they used. Do not go into this expecting it to smell like name - go into it with a totally open mind - almost forget the name and just experience for yourself what the scent is. Here are her comments that she sent me. I really get that when smelling the different scents. Its like because of all of the different ingredients you get a totally different smell. I feel like they really created something great with this line not just because it is affordable( althought that helps) but because it is something different to just about everyone. I have enjoyed reading the reviews so I could see what it smelled like to other people. It also helps me to identify scents that I couldn't place before reading some of the reviews. So, how are we supposed to know which one to get then? I'd like to know what to expect before I shell out the money - guessing games are for mystery grab bags. At least with reviews, we can get an idea what of the scents are before we buy. Well first of all - remember that these products were made largely to be sold in stores (not that they can't be sold online)- so a lot of folks are ordering them for their gift shops, etc. and selling them there where people can smell them first. As far as buying them online - I'd read the reviews - especially by reviewers that you trust and/or normally follow. I say that because it is very easy for someone to say "this smells like X" because they know it smells like that in another company's line or something and make up a false review (hey - it happens). So read several reviewers' descriptions of the scents - go to the DONA facebook page and read what the various folks are saying there. I will have a large portion of the scents to describe soon....and I think Cookie Monster Mike is getting most of them if not all of them. I'm not sure who else will be getting several scents. Thanks for the head's up, though. It really is appreciated. That's a pretty poor marketing scheme and it's going to be confusing as all hell for most consumers. I don't mind that the scent doesn't match the aphrodisiac scent, but for the scent to differ between product lines is pretty poor planning on their part. Indescribable is a lame marketing excuse. They have professionals that design the fragrances and know what specific ingredients are used. Sigh yet again another one of my posts were deleted. I responded to this discussion and now my post is gone. So either the forums are buggy or someone really does not like me! If I remember right, I had responded saying that this would make sense now, because I have Camu Camu Linen spray, and Camu Camu is NOT even on the ingredient list. I have to email Ashley about that! Sorry the forums are giving you problems. 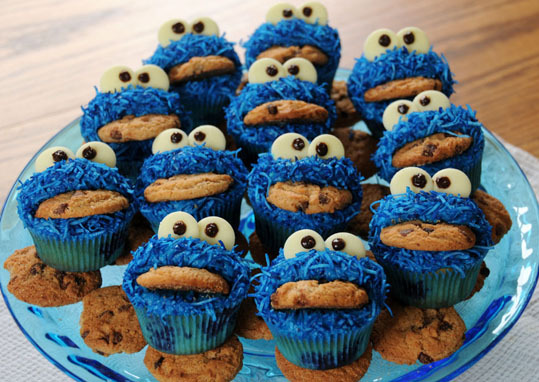 Have a Cookie Monster cupcake? I think what makes them smell differently is what they are mixed with. My mangosteen body polish doesn't have the exact same ingredients that my mangosteen body mist lotion has. So this gives it a slightly different smell. I have also noticed that the body polish smells different to different people. I smell the coffee very strongly with only a slight fruity smell, but my husband says that he smells the fruit stronger than the coffee that is present. Be sure to share her response..
Kindred, I probably stated that incorrectly. Here is what I mean. When you're using one of these products and it is a soap product like the lingerie wash or the body wash - the soap that is in it changes the scent somewhat. I find that the oil based products (massage oil, body mist lotion) carry the scent longer because of the oil base. The candle is VERY strong to me and while it is a lot like the mangosteen (the only one I have in the candle) - I just found it super duper strong. HOWEVER, with that said, I also was working with a bunch of fragrances at the same time. I am going to reburn it later when I have no other scents on my body, haven't just taken a shower with some of them, etc to see what I think. In fact with the candle, I will be burning it several times to get a better feeling for it - and in different places of the house where the venting might be different, etc. before I do a review...if I do a review. AHAHAHAHAHA those are freaking awesome! Thanks! I needed that pick-me-up cheery moment. I am having one of those frustratingly annoying days, I feel the headache brewing, and my left eye is starting to twitch! That kinda explains why my acai candle didn't smell like acai! (to me). Scent is always one of the hardest parts of a review for me, it's so subjective. Yeah I dont like Dona products. I think the massage oil was terrible. Wow, that makes a lot of sense for some of the DONA products I have. Thanks for the heads up! Thanks for posting this information! That must've been frustrating.